Botanical Name: 1. Aristolochia contorta Bge. ; 2. Aristolochia debilis Sieb. et Zucc. 1. Heat in the lungs manifested as cough with profuse yellow sputum and asthma. 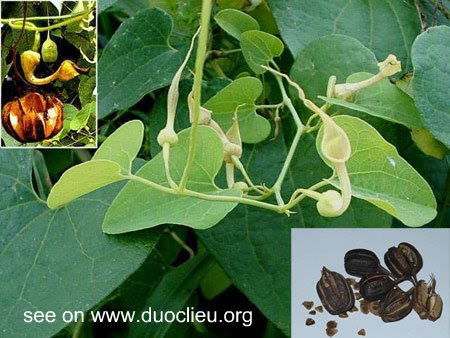 Birthwort fruit (Madouling) is used with Loquat leaf (Pipaye), Peucedanum root (Qianhu), Mulberry bark (Sangbaipi) and Scutellaria root (Huangqin). 2. Deficiency of the lungs manifested as cough with scanty sputum or with bloody sputum and shortness of breath. Birthwort fruit (Madouling) is used with Glehnia root (Shashen), Ophiopogon root (Maidong), Aster root (Ziwan) and Donkey hide gelatin (Ejiao). Cautions & Contraindications: Overdosage of the herb may cause nausea and vomiting.